All alone! Whether you like it or not, alone will be something you’ll be quite a lot. And when you’re alone, there’s a very good chance you’ll meet things that scare you right out of your pants. There are some, down the road between hither and yon, that can scare you so much you won’t want to go on…On and on you will hike. And I know you’ll hike far and face up to your problems whatever they are. Growth through personal hardship is a part of life, and this is where the arts – such as music or drawing – can play such an important role. Along the road of life one will undoubtedly encounter situations that may leave one feeling shattered or worse, jaded and cynical. Equally, loneliness often accompanies these periods of growth. During times of sadness and great disappointment, music and art can be a soothing balm for one’s soul. Music is healing – we know this – especially live music and singing. One can find numerous articles and research supporting the notion of music as therapy. From reducing anxiety to lowering levels of pain, music is hardly a frivolous pursuit, nor expendable, but I digress. I did not procure a ukulele until almost three years later. This past August, as I boarded a plane bound for my home province of British Columbia, one might say that the stars had finally aligned. M was attending a week long overnight summer camp for the first time, and I had managed to find a last minute airplane ticket that fit my budget. Whilst visiting my family, I began practicing the ukulele at my Aunt and Uncle’s house. My uncle had brought a ukulele back from Hawaii which he kept in his home office, complete with a musical stand and beginner sheets of music. How could I not play? On my last night there, we went to a tiny music shop in New Westminster, the kind of place that employs musicians and is brimming with stringed instruments in what seems like the most disorganized way. And there, I found my little ukulele. I knew if I didn’t purchase it then, I might not purchase one at all. Playing the ukulele has been remarkably therapeutic, something I did not necessarily anticipate. As I mentioned earlier, my desire to play a musical instrument came at a time where I was feeling particularly isolated and lonely. Though I do not feel this way now, there seems to be restorative aspect to playing the ukulele for me. It’s as if the frequencies are able to access some part of my soul that can only be reached and healed through music. I am able to express emotions and feelings where written words and drawing fail. 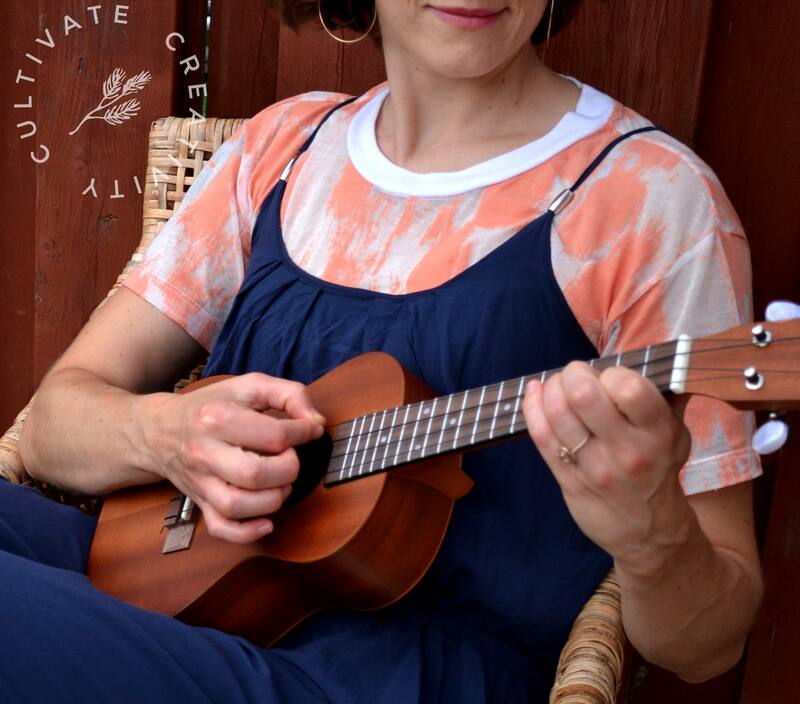 After all this talk of healing and growing pains, playing the ukulele is really a fun and accessible instrument and ultimately an enjoyable past time for me. Before I end this post, I want to point out some links below, in particular Guitars for Vets. This program is part of an organization called Vets Canada which helps veterans, who are facing challenges, to reintegrate back into civilian life. Guitars for Vets is a “program that matches veterans and still-serving members with PTSD or other service related disabilities with a gently used guitar and online lessons / volunteer lessons where available. Putting the healing power of music in the hands of heroes.” Please see the link below for more information.